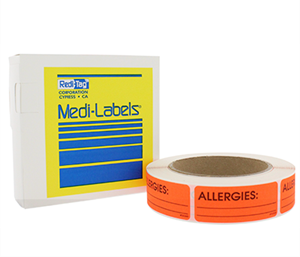 Make sure that a patient's allergies are seen immediately by caregivers with Medi-Labels. Removable adhesive will stay put yet remove when needed. 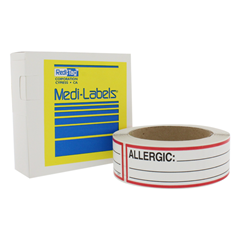 Bright and eye-catching fluorescent red labels provide ample room for writing drugs and other important information. Packed in a dispenser box for convenient use. Please note: web viewing does not allow for accurate fluorescent color reproduction. Label size: 2-1/2" x 1"